Newly renovated the a'Zambezi is now a 4 star hotel with sleek, modern room interiors. The hotel has an enviable location on the banks of the Zambezi River AND its conveniently located to all the amenities that Victoria Falls town offers. A big plus is that it has Joe's day fishing trips departing from the hotel. 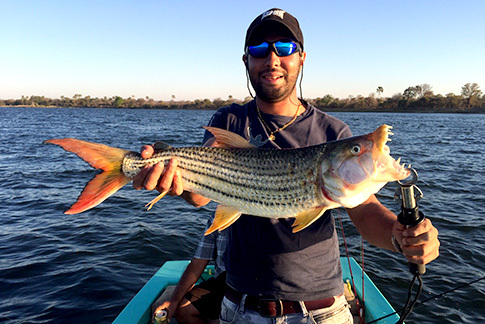 *We can book packages without flights to Livingstone - Let us know in your email enquiry. Watch this fishing video now! 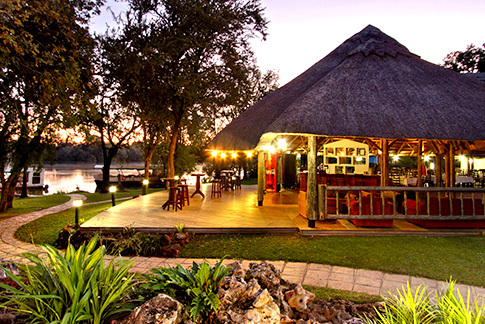 The a'Zambezi River Lodge has an enviable position on the banks of the Zambezi River. Only 4 kms upstream of Victoria Falls this is an affordable 4 star hotel within easy reach of all the attractions in Vic Falls. The a'Zambezi River Lodge has 87 modern rooms of which 50 rooms are river facing and 37 face onto landscaped gardens. All rooms have en suite bathroom facilities that feature a shower, bath, basin and toilet. In room facilities include a tea and coffee making station, mosquito net, air-conditioning, direct dial telephone and satellite TV. Complementary daily shuttles into Vic Falls town. Wi-fi at the main lodge area.